NEW YORK (AP) — Deepening worries about global economic growth, particularly in China, set off a rout in riskier assets including technology stocks, copper and crude oil Wednesday. U.S. retailers took a drubbing after Macy’s reported weaker sales. An unexpected drop in profits for Chinese tech giant Tencent surprised investors and added to some recent concerns about the health of China’s economy. Tencent, a gaming and messaging company, is the most valuable technology company in China. Earlier this week, reports on growth in factory output, consumer spending and retail sales in China were all slower than expected. Large technology companies including Alibaba and Baidu of China and U.S. tech giants including Facebook and Microsoft fell. Oil prices sank and copper plunged to its lowest price in a year as investors worried about the health of the global economy. The S&P 500 index had its biggest decline since late June while traditionally safe investments like bonds and high-dividend stocks rose. The S&P 500 slid 21.59 points, or 0.8 percent, to 2,818.37. Earlier it fell as much as 1.3 percent. 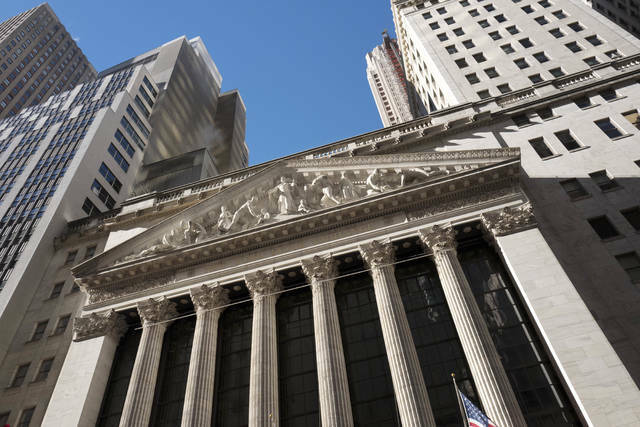 The Dow Jones Industrial Average fell 137.51 points, or 0.5 percent, to 25,162.41. The Nasdaq composite dropped 96.78 points, or 1.2 percent, to 7,774.12. The Russell 2000 index of smaller-company stocks sank 21.91 points, or 1.3 percent, to 1,670.67. Jefferies & Co. analyst Karen Chan said Tencent’s revenue was also disappointing, mostly because of weak results from its mobile gaming business. Tencent’s stock fell 3.6 percent in Hong Kong. The U.S.-listed shares of online retailer JD.com fell 4.5 percent to $32.36 and web search company Baidu gave up 1.3 percent to $213.47. U.S. crude sagged 3 percent to $65.01 a barrel in New York and Brent crude, the standard for international oil prices, lost 2.3 percent to $70.76 a barrel in London. Copper tumbled 4.5 percent to $2.56 a pound, its lowest price in more than a year. Copper is considered an important economic indicator because of its uses in construction and power generation, and copper futures have fallen more than 20 percent since they hit an annual high of $3.30 a pound in early June. Macy’s plunged 15.9 percent to $35.15 after reporting that its sales slowed in the second quarter. Kohl’s shed 5.8 percent to $74.39. Department stores have struggled for years as investors worried about the growing threat of Amazon and other online shopping options. Wednesday’s losses interrupted a huge rebound for the stocks in 2018. Banks fell because of a sharp drop in interest rates, which make mortgage and other loans less profitable. High-dividend companies like utilities and phone companies did better than the rest of the market. Investors often treat them as an alternative to bonds and buy them when yields fall. Turkey’s currency stabilized and rose after authorities sought to ease liquidity problems in the banking system. But Turkey imposed $500 million in tariffs on U.S. goods as tensions between the countries increased. There is also no sign that Turkey’s president will let the central bank raise interest rates, which economists say it should do urgently to support the currency. The Turkish ISE National 100 index slumped 3.4 after a gain of 0.8 percent Tuesday. Indexes in other emerging markets including Brazil and Russia skidded as well. Wine and beer maker Constellation Brands is ramping up its investment in cannabis company Canopy Growth by buying $4 billion in stock. Canopy shares soared 30.4 percent to $32.11 while Constellation Brands skidded 6.1 percent to $208.27. Tesla slipped again after Fox Business reported that the Securities and Exchange Commission subpoenaed documents from the electric car company as a previously-reported inquiry into the company intensifies. CEO Elon Musk tweeted last week that he was considering taking the company private and had secured funding to do so. At least two lawsuits have been also filed over that tweet. The stock spiked after Musk’s message but has surrendered that gain. On Wednesday it fell 2.6 percent to $338.69. Germany’s DAX fell 1.6 percent and the French CAC 40 lost 1.8 percent. In Britain, the FTSE 100 retreated 1.5 percent. Japan’s Nikkei 225 index fell 0.7 percent and in Hong Kong, the Hang Seng dropped 1.6 percent. South Korea’s markets were closed for a holiday. In other commodities trading, gold lost 1.3 percent to $1,185 an ounce. Silver fell 4 percent to $14.45 an ounce. Wholesale gasoline fell 1.8 percent to $2 a gallon and heating oil lost 1.8 percent to $2.09 a gallon. Natural gas dipped 0.6 percent to $2.94 per 1,000 cubic feet. The dollar fell to 110.57 yen from 111.22 yen. The euro rose to $1.1346 from $1.1339.